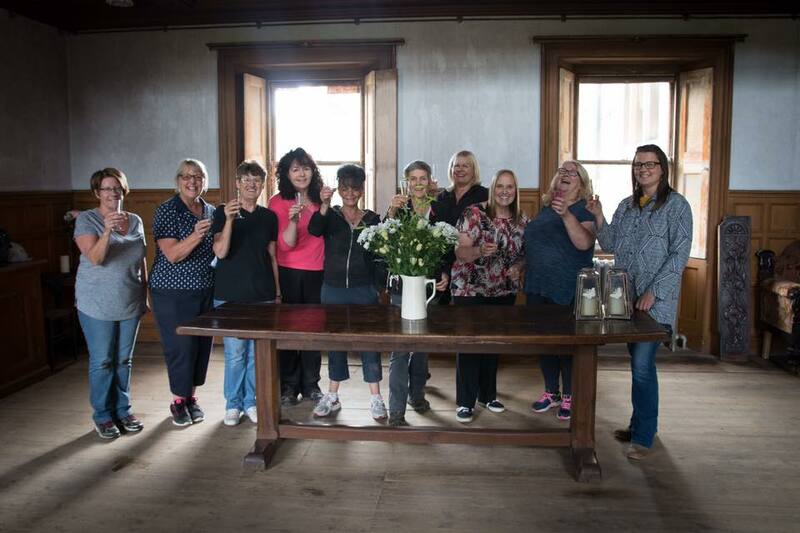 We would like to congratulate our volunteers on another brilliant and successful event at Bannockburn House. The Christmas Fayre 2017 only happened due to the commitment and hard work of all volunteers. Thank you to the ladies from Braehead Community Garden for putting on the super Victorian tea room which was as popular as ever, the hard working craft group for all their wonderful items on sale in the shop, Santa David and Elfie Marie, our wonderful drivers who did a great job as always, in getting our visitors and volunteers safely to and from the house and all the other volunteers who were happy to help out wherever needed and worked so hard to ensure the event was a success. More thanks . 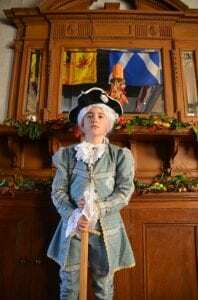 . .
Then there was Bannockburn Houses’ young Bonnie Prince Charlie, Duncan, who was meeting and greeting folk at the door, he looked so smart and really looks the part doesn’t he? Thanks Duncan and see you next time. Thank you to our Jacobite friends for coming along even though it proved just a bit too cold in the house for some, although one of you managed till the end, well done Marty. Also a thank you to Paraig MacNeil, the Scots Bard, for his traditional storytelling which proved very popular with the visitors. I particularly want to mention our car park heroes Morag and Lorna who not only sorted out all the parking for our visitors in the cold all day on Saturday, but also ended up directing traffic on the main road following quite a nasty accident at Corbiewood. Lorna also did the car park again on the Sunday with her partner, Liam. What a team, a big thanks guys. The event was made even more special by the live traditional music provided on Saturday by Eilidh Macintyre, from the Feis Fhort in Falkirk along with Callum from the Falkirk Young Trad Project, and on Sunday sounds by Bannockburn’s very own Dave Cantwell and Jock (sorry, we don’t know his surname) and young Arran Green, age only 10 years, who blew us all away with his piping skills, thanks to you all. We must not forget the Victorian style roasted chestnuts provided by Callum, National Trust Ranger from Dollar Glen and his son Caiden, thanks to you both for giving up your whole weekend to do this in the cold and rain. We met many people interested in volunteering and there were around 60 people who signed up for trust membership, so we are well on our way to meeting the requirements for the Scottish Land Fund in getting 400 members in two years. The project is coming to life and partnerships are being forged, it’s exciting and utterly brilliant, let’s keep it going! Next story Christmas Fayre Thank You!